Add this handy item to any sink in order to make all sorts of tasks easier. It is ideal for kitchens, bathrooms and laundry rooms, but can also be installed on virtually any other sink faucet to instantly transform it into something more useful. Not only does it pivot to any angle, but it also has a stainless steel extension hose that provides extra reach when you need it. This can be handy for washing inside cups and other dishes, giving pets a bath, or just reducing time and effort when spraying your sink clean. The dual function head allows you to switch from a steady stream or gentle shower by just pulling down. Quick and easy installation will have you operational in just seconds, with no tools necessary. Unlike other sprayers that only pivot in place, this Deluxe Swivel Spray Aerator also adds some length. With this added feature, you will be able direct a more powerful stream to right where you need it. Instead of turning up the water to get the stream to arc into the right spot in your sink, simply use your hand to point the hose and spray nozzle right there. The additional length makes up for lack of pressure in order to help with all of your sink related chores. Because the hose is made from stainless steel, you know that you will be able to bend and flex it for many years without any worry of it breaking or wearing out. With two types of sprays, this attachment will add functionality to your sink by allowing you to choose the right type of flow for what you are doing. It can operate like a normal faucet with a thick steady flow of water, or you can switch it to the other mode where it sprays out many smaller streams of water, sort of like a shower. No more filling up cups and dumping them out to get things rinsed, and no more shaking water inside of glasses to rinse them clean. Use this sprayer to rinse out dishes quickly and efficiently, or direct a powerful stream of water to any part of your sink. When attached to your kitchen sink, this sprayer will give you all of the utility of a commercial kitchen sink. You will be able to reduce time and effort for just about everything you do thanks to the versatility and functionality of this product. Wash and rinse dishes faster, clean up quickly after preparing foods, fill tall or awkward items with water and so much more. It will make it easier to rinse produce, strain pasta, fill ice cube trays, you name it. With more reach and maneuverability, it is hard for this thing to not be an improvement to your kitchen. Bathroom sinks are pretty small and compact, but we do a lot of stuff in there. One of the nice things about this Swivel Spray Aerator is that you can put it on, or take it off in just seconds. Some people like to keep it permanently installed in the bathroom, and some just quickly twist it on when needed. In the bathroom it can make it easy to wash faces, shampoo hair, clean pets, bathe babies and more. Hair cuts and shaving make a huge mess in the sink, but this device cleans it up quick and also makes it easier to do in the first place. Spend less time on the annoying stuff when you have one of these for your bathroom sink. Attached to the faucet of a utility sink, this sprayer is really at home. Tasks like spraying clean soiled clothing or hand washing delicates is simplified by this attachment. If your utility sink is not in the laundry room, then it becomes handy for potting plants, rinsing boots, washing your dog and more. None of us like to clean clothes or do the dirty chores that involve our utility sinks, but when you have a better tool for the job, the frustration can be eliminated. Stop struggling with the useless faucet that your sink is equipped with now, and start making your life easier. This affordable attachment can improve the functionality of the sink in your laundry room, basement or garage in order to save you time an effort. High quality materials ensure proper function and increased longevity with this sprayer. It features a brass fitting where it connects to your faucet, and mostly metal components elsewhere. The extension hose is made from stainless steel, and any part that would wear is made from high quality materials and designed to last. The included adapter will allow you to attach it to almost any sink, so you don't run the risk of compatibility issues when you buy one. Simply use the adapter or not based upon the type of threading your faucet has. Use it to improve the functionality of any sink in your home, or save money when you outfit several sinks with the same order. It could not be easier to hook this thing up. No tools are required, and everything you may need is included with your purchase. You can use an adjustable wrench to tighten it in place if desired or necessary, but most people will find it easy enough to just twist right on by hand. When you receive the sprayer, you will notice that a plastic adapter is pre-installed on the female end of the fixture. Depending upon the faucet you are attaching it to, you may want to keep this in place, or remove it. This allows for the versatility of being able to install whether the threading is on the inside or outside of the faucet. Once you determine if the adapter is needed simply twist the sprayer into place and tighten all the way. Once secure, turn the water on to test. If you experience leaks, make sure it is on straight. If it is, a single layer of teflon tape should fix the problem. Simply wrap the thread, and then re-install to eliminate the leak. In most cases this will never be necessary as this spray nozzle comes equipped with pre-installed sealant washers that ensure a tight, leak-free fit. Don't settle for a regular old faucet in your home when you could benefit from this affordable enhancement. Order Yours Today! Uses Add a 360 degree swivel to your kitchen, bathroom or laundry room sink Added extension allows you to pivot to any angle, but also spray into difficult areas. Get a more powerful stream right where you want it. Material Metal & Plastic - stainless steel and brass fittings with plastic casing in some places. 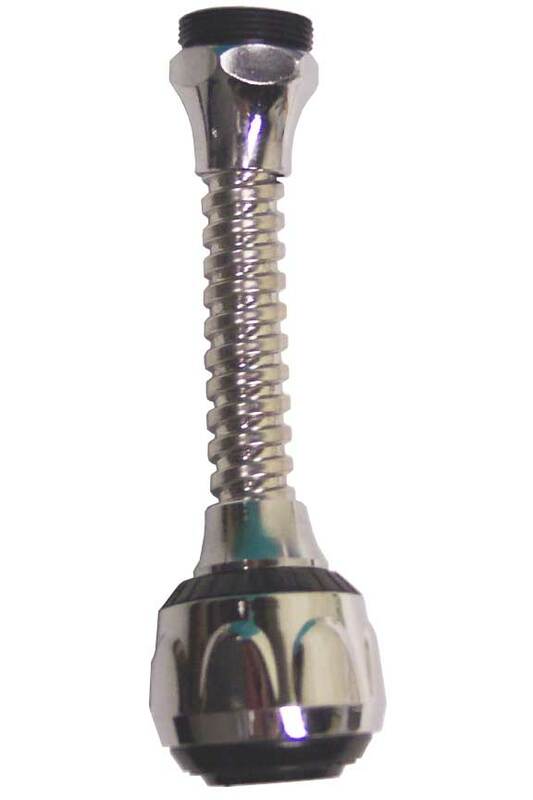 Extension hose is stainless steel. Dual Mode Yes - Pull down to switch from thick steady stream to gentle shower. Compatibility Works with virtually any sink. 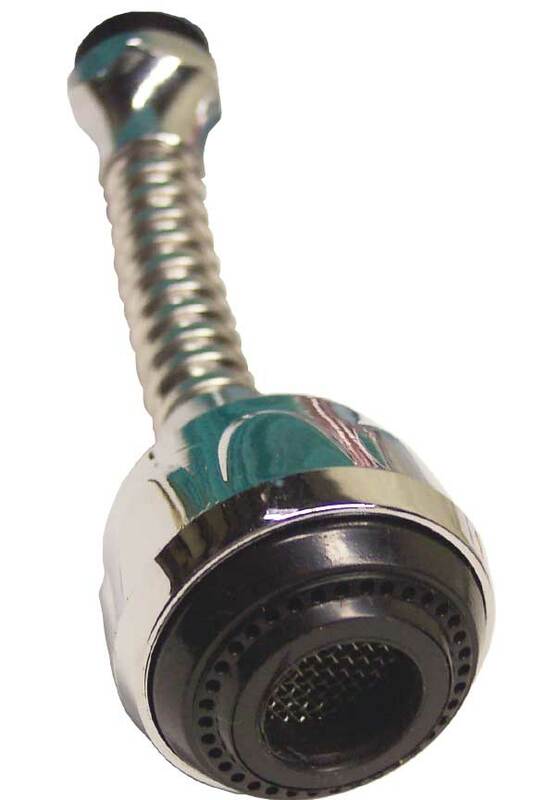 Included adapter allows for attachment on sinks with inner or outer threading. Deluxe Swivel Sink Sprayer - Attach to any sink faucet to add a dual function spray nozzle that can pivot to any angle. Take advantage of the 3" extension hose to rinse inside things easily or provide a more powerful stream right wehre you need it. Order Yours Today! Works fine. Nice that it isn't plastic. Haven't had it long enough to fail, but still planning to buy 2 more. We just love it, its real flexable. The spray works great. This was definitely worth the $6 or whatever I spent on it. It gives my faucet a great range of motion allowing me to wash/rinse the entire sink and then some. The aerator part is also nice. You can choose between the regular stream and the concentrated beams. It doesn't add pressure like a regular separate sprayer head does, but it is still more effective at rinsing than the regular stream. Overall I'm very happy with this purchase. I'm torn between 4 and 5 stars. I lean towards 4 because I was hoping it would be closer in effectiveness to a separate sprayer. 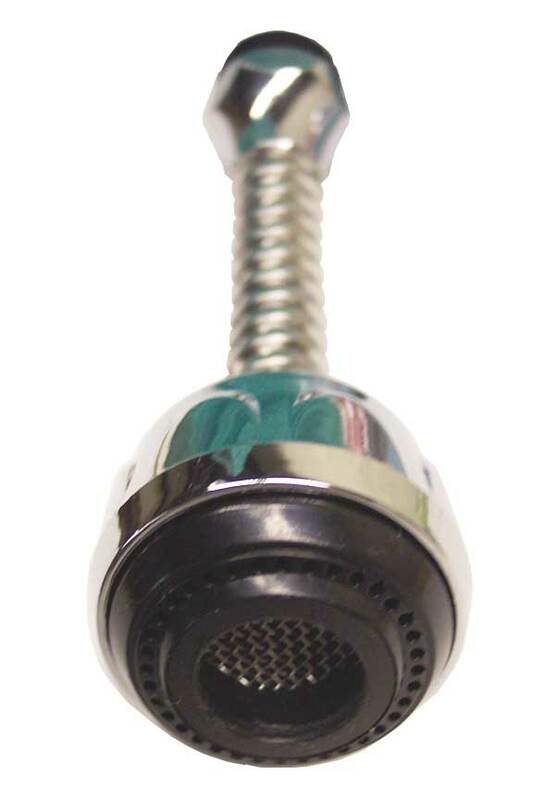 I would describe this moreso as an improved faucet head rather than a sprayer alternative. This item does add effectiveness and functionality and overall is high quality. 4.5 stars. I would recommend this to a friend. It is very difficult to find a sprayer for a laundry tub with a standard 2 knob faucet...ours is more difficult as it has a garden hose threading on the faucet. This sprayer works really well as a substitute sprayer for a laundry tub. I did have to buy an adapter for the garden hose threading from a hardware store to make it work. Hi, What is the diameter of the black adapter at the top please? It is a little less than an inch. Probably 7/8"
Super Fluffy, Shag-Like Bath Mat. Extremely Absorbent & Fast Drying. A Spa Quality Sponge Infused With Soap. Pamper Your Skin On The Go.